MTS, the CDMA Mobile Service Operator with over 11 million wireless customers today expands its exciting ½ paisa per second tariff for “LIFETIME’ on all local and national outgoing calls made to any telecom network in the country in all remaining circles across India. If you remember, MTS launched its Msaver 191 (½ paisa per second tariff) in some telecom circles on 27th May,2011 as we shared it first on TelecomTalk. 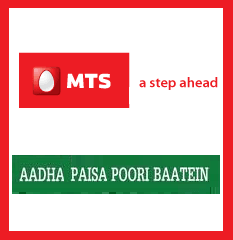 Now Existing MTS mobile customers in all telecom circles can avail this offering for Rs. 191. On the other hand new MTS mobile customers need to pay Rs. 203. Both existing and new customers will also get a talk time of Rs. 50. MTS has also introduced an Auto Renewal Process through which MTS customers can continue using this tariff benefit for lifetime by doing a cumulative usage/recharge of just Rs. 900 over a period of six months. To make it convenient for the customers, this cumulative recharge can be in the form of recharge vouchers for Voice or SMS usage. What is the importance of lowering the tariff even if you are not able to provide services , with high rates of call dropping and very poor connectivity with BSNL landline..! What would be the roaming rates????? ?